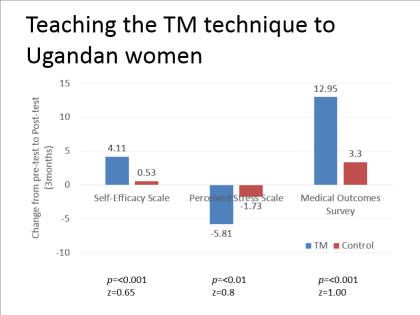 For her PhD dissertation, my friend, Leslee Goldstein, did research teaching the Transcendental Meditation technique to Ugandan women who were part of an NGO (non-governmental organization) program that taught them skills to help them support themselves, such as sewing. These women had been subjected to a huge amount of stress in their lives and this stress made progress difficult. She did 3 pre- and post-tests that are commonly used in this situation and got great results. But when she created the chart in PowerPoint, she had a problem. As you can see, by default PowerPoint puts the horizontal axis labels near the axis. Usually, this works, but when you have a combination of positive and negative numbers, the bars interfere with the labels. 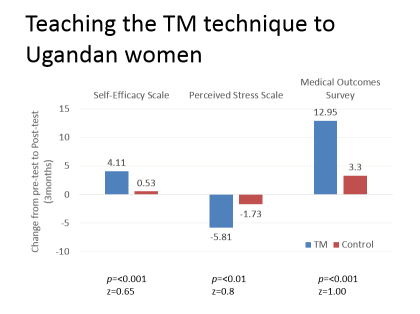 While the results for the Self-Efficacy Scale and Medical Outcomes Survey increased, the Perceived Stress Scale numbers decreased. 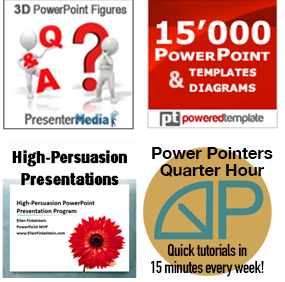 Do you have frustrations getting charts to look right in PowerPoint? Leave a comment! Thank you!!! My problem is solved!